Our step-by-step series will take you through the entire home-buying process — from finding a buyer’s agent to settlement day, and even to maintaining your home after you’re all moved in. Every first-time buyer will find this information-packed series easy to follow and understand. Make sure to tune in for the next few weeks! Before you start looking for a home you must first define and choose the type of life you want to live. Your answers to the questions below will help make sure that your real estate decisions and the home you buy will match this life you want. You’re the one who will be living in this home every single day, living in this neighborhood, and living this lifestyle day in and day out. Is it the right fit for you and your family? We want you to be happy with all of it, and that starts with what YOU want. Your self-analysis at the very start should hopefully lead you to the right home purchase for you and your lifestyle (and yes, budget!). Most real estate agents don’t approach home buying this way. We find that it’s important to ask yourself questions that dig deeper than the traditional “How many bedrooms you would like in a home?” questions. These more revealing questions that delve into detailed aspects of your needs and desires give you the opportunity to think carefully about what you want this next step in your life to be like. Your honest answers to these questions are what should drive your home search. This is NOT silly fluff!! Your answers to these questions below will help you avoid a personal and financial disaster when it comes to real estate. Time — If you first decide how long you plan on living in this next home, then you can understand what purpose your home will serve, and everything else falls into place. Questions like how many bedrooms and if schools are important become very easy to answer if you base them on how long you plan on living in this next home. What plans do you have during that time period and how will these affect your home needs, such as space for children or a growing family? Location for a job or school? What is the ideal time frame for purchasing this home? Do you have a specific deadline? Why is this timing important? Are you willing to wait longer if the market’s timing for your home is not the same as your ideal timing? Daily Life — You may not realize it, but it’s the little habits that make a big difference. What about your current daily life do you love and are not willing to give up? For example, do you love being able to walk or bike to work? Do you love going to your local coffee house every day? Do you like to go for runs outside? Do you like to garden? What is your actual reality? Are you a home body? Do you love having people over and would love to have the space for entertaining at home? Are you out every night? Do you love to be near restaurants, theaters, or close to more vibrant areas? Do you hate crowds, busy streets and traffic? Do you see that changing at any point during your timeframe for living in your next home? Do you work late and need to be close to the office or have a quick, easy commute? How important is a car and/or parking space to you? Do you want a car-free life where you can walk or bike everywhere; or at least get an Uber or Lift? Or you can’t imagine your life without owning a car. When and where do you feel most happy and engaged during your day? What frustrates you most each day? Personal Goals – You don’t want to sacrifice your goals or outside pursuits once you’re homeowner, so make sure you include them in your decision making. What are your personal goals and how will these affect your home needs or budget? For example, do you plan to change jobs at some point and your finances may change – a possible increase or decrease in salary? Do you want to work from home eventually or start your own business and may need space for an office and supplies? Would you prefer to live in a less expensive, possibly smaller, home so you have the funds to travel the world or for a favorite hobby? Location – Where you live will affect everything about your lifestyle – from whether it has urban conveniences, lots of quiet green space, or even the types of homes available to buy – condo apartment, row house, townhome, or single-family home. Do you consider yourself a “location person” or a “house person”? Do you get more excited about the local amenities or the features inside your house? Usually people tend to be more one than the other. Which are you? What is your ideal location and why? Where do you commute to and what is your preferred method of getting there? Would you prefer to have a longer commute to get more space? Or, do you want to live in the middle of a more urban community and possibly have less living space? Are schools in the neighborhood a factor for this home purchase? Do you feel the need for green space, lots of trees, more open space, less buildings and streets, and not having neighbors’ homes too close to yours? Do you love to garden or want a large backyard for children or dogs? Or is a playground or dog park nearby sufficient? Yes, Please and Never Again! – Some things you’re excited to actually have as a homeowner, but maybe there are some amenities in the past that you thought you’d love but never did or never used. What about your current home would you like to change or be different in your next home? (Or what absolutely bothers you every day in your current home or rental?) Do you want: Bigger closets? Less noise? More amenities nearby? Office space? More convenient shopping options? More modern and sleek features? More historic or vintage home? What is the absolute most important, can’t-live-without it, deal breaker thing you MUST have? (We all have one.) Do you really, really want that master bedroom suite or that large eat-in kitchen? What can you compromise in a home? Describe your ideal scenario when it comes to your home purchase and why. Pat yourself on the back for taking the time to carefully go through these questions. Your answers will provide some important insights on where you want to go with your life and your expectations for your new home. 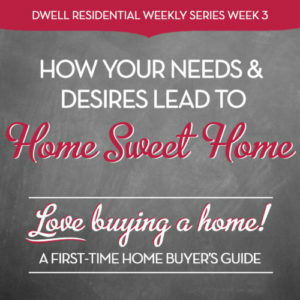 Look out for the next article in our weekly series, Love Buying a Home series. The next step is all about knowing your budget and how to correctly figure it out so you’re not house poor or cutting yourself short. You don’t want to miss this one — Do the Math – A Mortgage You Can Afford.